Pulse is a documentation-centric social collaboration platform that enables you to connect, collaborate, and share knowledge with fellow authors, employees, and your end users. It functions much like many of the social media websites on the Internet, except it revolves specifically around your online output. It also gives you the ability to view several types of reports about your project, including which topics are being seen the most and which search terms are not yielding any results. Pulse gives you to form communities and groups around the following different types of users, who can all use Pulse to communicate and facilitate exchange of ideas and information. Administrators Administrators are users who have complete access to all Pulse features and functionality. They have exclusive control over deleting other users' content, adjusting server settings, and accessing reports. Employees (Advanced Users) These are users who have been given a higher level of access to Pulse features and functionality by the Administrator. They have a wider range of options when it comes to directly communicating and interacting with other users, ranking topics, voting on answers, and filtering content. They do not necessarily have to be employees of your company. That is simply the term used in Pulse. Customers (Basic Users) These are users who have basic access to Pulse features and functionality, such as creating a profile, subscribing to topics, and posting content such as comments, articles, questions, and multimedia. They do not necessarily have to be customers of your company. That is simply the term used in Pulse. General Public (Unregistered) These users have restricted access to Pulse. They can read comments, search comments, see topic ratings, and add a topic rating. System Requirements As you prepare for your Pulse installation, familiarize yourself with the minimum system requirements, depending on the operating system. See Windows Server 2012 Requirements, Windows Server 2008R2 Requirements, and Windows Server 2008 Requirements. Deployment Types Pulse can be installed on one or more systems running the required version of Windows Server. The installation type that you choose will largely depend on factors that are specific to your environment, such as the number of users you plan to host, your web usage, and other factors related to deploying an SQL database and IIS server. See Deployment Types. Install the Prerequisites To prepare for a Pulse installation, you will need to prepare the systems that will be hosting the Pulse server application and the Microsoft SQL Server instance for the Pulse database. See Installing the Prerequisites for Windows Server 2012, Installing the Prerequisites for Windows Server 2008R2, and Installing the Prerequisites for Windows Server 2008. Install Microsoft SQL Server You can install a Microsoft SQL Server instance to use as the Pulse database. This instance can reside on the Pulse web server (this is the server running IIS) or on a different system with access to the Pulse web server. See Installing Microsoft SQL Server. Install Pulse After preparing the Pulse web server and database server for the installation process, you can install Pulse. See Installing and Activating Pulse. Pulse Server Configuration After the Pulse server application is installed on the Pulse web server, use the desktop shortcut or the Programs menu in Windows to start the Pulse application. See Pulse Server Configuration. Integrate Flare With Pulse To integrate the embedded discussion forms and other Pulse features with your Flare output, add a new community in Flare. This action automatically creates a new system in Pulse, allowing your web server to host, store, and serve the embedded discussion forms that appear below the topics in your Flare output. This system also gives you and your team members the ability to moderate and administer the Pulse features and content from the Pulse dashboard. See Integrating Flare and Pulse. 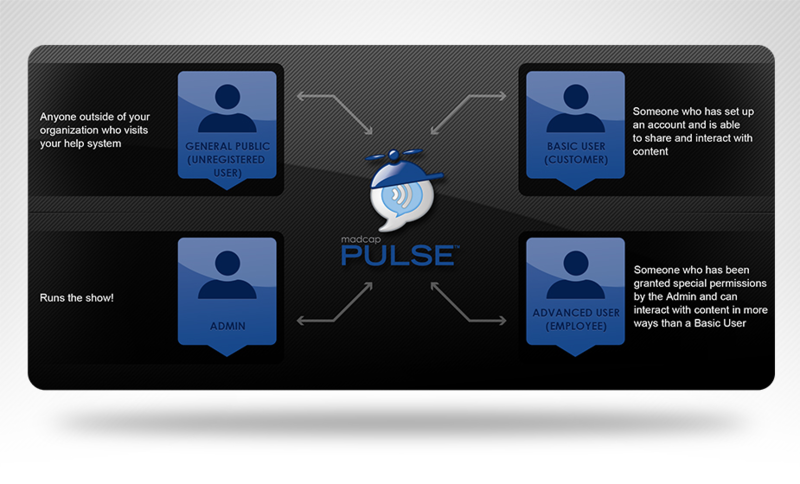 The Pulse dashboard is the web-based interface to the Pulse system. Depending on your group membership, authorized users can use the dashboard to configure a variety of server settings, administer users and groups, moderate the Pulse content associated with your Flare output, and access some basic end user features. See About the Pulse Dashboard. Registering When you integrate a Pulse system with a Flare community, there are two methods for joining the community. Both methods require you to register and activate an account. See Registering for a Pulse Account. Logging In Once you have registered for a Pulse account, you can log in to the Pulse dashboard or you can log in to the published Flare output to use the community features. See Logging In to Pulse. Creating and Editing Profile Registered Pulse users can edit their account profile by changing their personal information, uploading a profile images, and specifying their notification settings. See Editing Your Profile. Posting Content Users can post content in a variety of ways, including status updates, questions, articles, and tasks. See Posting Content. Responding to Posts Users can respond to posts by adding comments; following, liking, and tagging posts; and mentioning documents, people, and groups. See Responding to Posts. Messaging The Messages app gives you the ability to read, send, and hide conversations with other Pulse users. You must access the Messages app from the Pulse dashboard. Messages are not accessible from the Flare content. See Messaging Tasks. Moderating Pulse If you are a member of the Administrators or Employees group, there are two user interfaces for moderating the activity in your Pulse system. You can use the Flare output and/or the Pulse dashboard. See Moderating Pulse. Searching Pulse When integrating a Pulse system with a Flare community, you have two different search options. You can search a feed in Pulse or, if you enable the feature, you can extend the scope of a Flare search to include the Flare community results stored in Pulse. See Searching for Community Results. Note: Although it is similar to Feedback, Pulse is newer and offers a more complete solution for incorporating social collaboration in your output. There is an upgrade path for Feedback users who would like to move to Pulse. This can be done when you install Pulse. There is an option to "Import Feedback Data." This wipes out your new Pulse database and imports all of your Feedback data. When you import a database from Feedback, your report data, comments, and users are imported. Since Feedback users do not have a password associated with their email address, their passwords are their email addresses (e.g., if you have a user with bob@email.com, his password will now be bob@email.com). However, users can change their passwords by clicking "I forgot my password" from a Pulse login screen. Note: MadCap Pulse is an optional feature in Flare that is sold separately.